Anywhere you look, statistics about the success of the common guitar teacher are sadly discouraging. The majority of guitar teachers have few (if any) really great students and for most, earning even $50,000 per year seems unrealistic. Many become so frustrated, that they quit teaching altogether and go to work at some non-musical day job, spreading the myth that “it’s hard to earn money teaching guitar”. Here is the reality: “Guitar teachers” don’t fail - people fail. Guitar teaching as a profession is (or can easily be) incredibly lucrative, stable and rewarding (you’ll see how in a moment). After building my own 7-figure business teaching guitar, helping thousands of people become truly incredible guitarists and coaching many guitar teachers to earn multiple 6-figures per year, it is now proven that there is virtually unlimited potential for success in teaching guitar. Guitar teachers don’t fail because it’s hard to become successful in this career field - they fail because their mindset drives them to failure. Guitar teachers are notorious for having a very cynical outlook on life in general. It is this cynical mindset that makes it impossible to achieve big success teaching guitar. Before I show you why this mindset will destroy your guitar teaching career, take 3 minutes to assess your current success potential. Complete this free assessment: “Will You Become A Successful Guitar Teacher?” before reading below. 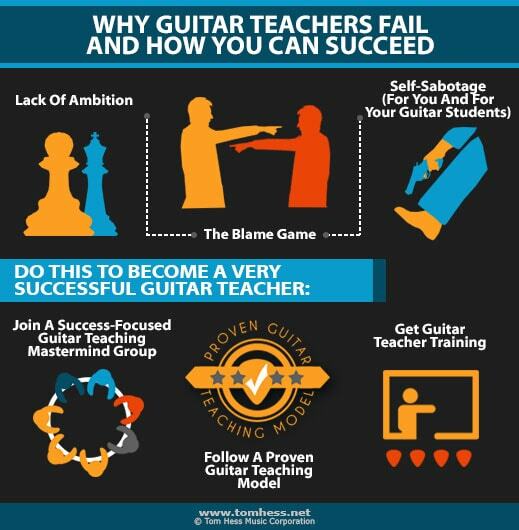 Here are the top reasons why the mindset of most guitar teachers leads to predictable failure and how you can turn this around to become highly successful. They don’t know anyone personally who has ever achieved this level of success teaching guitar. They don’t believe that it’s possible for them personally to become successful. They have been surrounded by cynical & negative people all their lives who told them things like: “You can’t earn a lot of money teaching guitar” or worse, “you shouldn’t try to earn a lot of money teaching guitar”. This cynical mindset prevents most guitar teachers from ever doing anything that would lead to success and creates a vicious circle of negative beliefs that only guarantees failure. When it comes to your guitar teaching credentials, there is only one that really matters - the training that you have (or don’t have) on how to teach guitar. Fortunately, this credential is one you can easily get at any time and it doesn't require you to invest tens of thousands of dollars and 4 or more years of your life (like a traditional music degree does). More importantly, getting guitar teacher training will show you how to easily overcome all the challenges and problems you currently consider impossible to solve in your guitar teaching. at attracting new guitar students. Discover how to make your guitar teaching business more succesful. Learn 11 steps you should take to earn more money teaching guitar. They will sense your own lack of belief and conviction in what you are doing and will not take guitar lessons with you (or their own practicing) seriously. Your own cynical attitude inadvertently turns your guitar students into cynics about their own musical potential. Because you are not “all in” (100% committed) towards becoming the most successful guitar teacher you can possibly be, you will not take the actions needed to learn how to teach your students in the most effective ways possible. As a result, your reputation will spread throughout your local area and serious guitar students (the ones with real money to spend on lessons and who are totally committed to becoming the best musicians possible) will never study with you. In the end - everyone loses (and you lose the most). 1. Join A Success-Focused Guitar Teaching Mastermind Group: This refers to a group of guitar teachers who are either highly successful already or are well on their way to earning 6-figures per year teaching guitar. Note: Almost all public guitar teaching forums you find online are full of cynics and unsuccessful teachers who are barely getting by financially - avoid them! Instead, seek out guitar teachers who truly are champions in their local areas and who have proved all the naysayers wrong. Top success coach Tony Robbins has stated: “People’s lives are a direct reflection of the expectations of their peer group.” This couldn’t be more true for guitar teachers. While the cynics can only drag you down by telling you about their own failures, truly successful guitar teachers will only pull you up and help you to become wildly successful too. 2. Follow A Proven Guitar Teaching Model: After you take action to surround yourself with the most successful guitar teachers and develop a champion mindset, you must do what they did: acquire a blueprint for your guitar teaching success. This refers to the training, tools, strategies and support systems to build your highly successful guitar teaching business. When you have this, nothing can stop you from becoming the #1 guitar teacher in your area…except yourself. Warning: To get the maximum benefit from these action steps, you MUST first purge all traces of cynicism from your mind and get on the same mental wavelength with the world’s top guitar teachers. To do this, take this guitar teaching assessment: Will You Become A Successful Guitar Teacher? and get free feedback from me on your progress towards becoming a successful guitar teacher. Learn how to become the #1 most successful guitar teacher in your local area - get the very best guitar teacher training.